Strong winds and more snow hit the Midwest on Friday following a spring storm that buried several states in snow, while forecasters warned churches in the South to prepare for strong thunderstorms and potential weekend tornadoes. 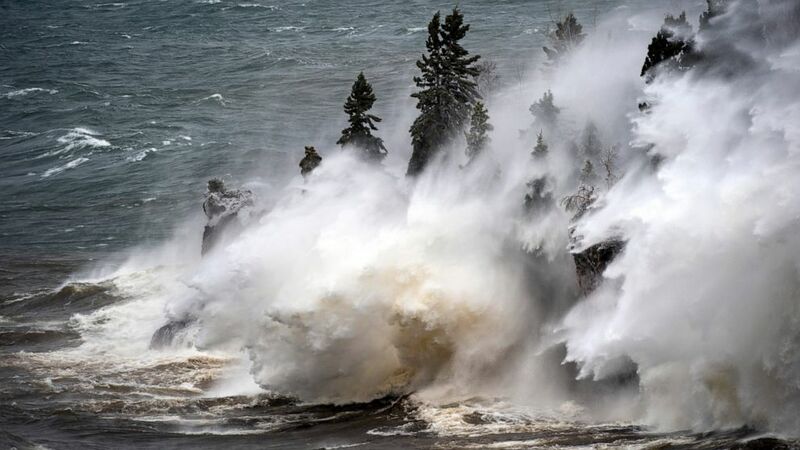 The storm hovering over parts of Minnesota, South Dakota and North Dakota was the second "bomb cyclone" storm system to hit the region in a month. The blizzard was blamed for hundreds of vehicle crashes in Minnesota and left behind 25 inches of snow (63.5 centimeters) in northeast South Dakota. Authorities in central Minnesota said lightning struck a tree and a shed in the city of Isanti during a rare "thunder snow" storm, sending the building up in flames. Flood warnings were issued Friday for the Red River along the Minnesota-North Dakota border, but the river wasn't expected to swell to levels seen during last month's severe Midwest flooding, said National Weather Service forecaster Greg Gust. Forecasters warned that unseasonably low temperatures would remain through the weekend in the region following a low pressure system in the southwest U.S. that created two separate "chunks of energy," one in the Midwest and one in the South, Gust said. "It is part of the same one-two punch that has accompanied the storms over the past few months," Gust said. "An upper cut followed by a hook." Gusty wind, hail and potential tornadoes were forecast Saturday in parts of Louisiana, Mississippi, Arkansas, eastern Texas and western Alabama. Similar weather was forecast Sunday in Georgia and the rest of Alabama, said Adam Baker, a weather service forecaster. "Even a weak tornado that hits the right location can still be pretty devastating," Baker said. The National Weather Service office in Birmingham, Alabama, warned churches to have someone monitor the weather during Sunday services amid heightened risk for damaging tornadoes. The agency advised pastors to figure out the safest location for their congregations in case of severe weather, noting that large open rooms such as sanctuaries and auditoriums weren't safe. A series of tornadoes on Palm Sunday in 1994 killed 40 people in Georgia and Alabama, and injured hundreds more. Half the deaths occurred when a tornado struck a rural Alabama church during services, causing the roof to collapse, according to a report about the damage by U.S. weather officials. Associated Press writer Sudhuin Thanawala contributed to this report from Atlanta.